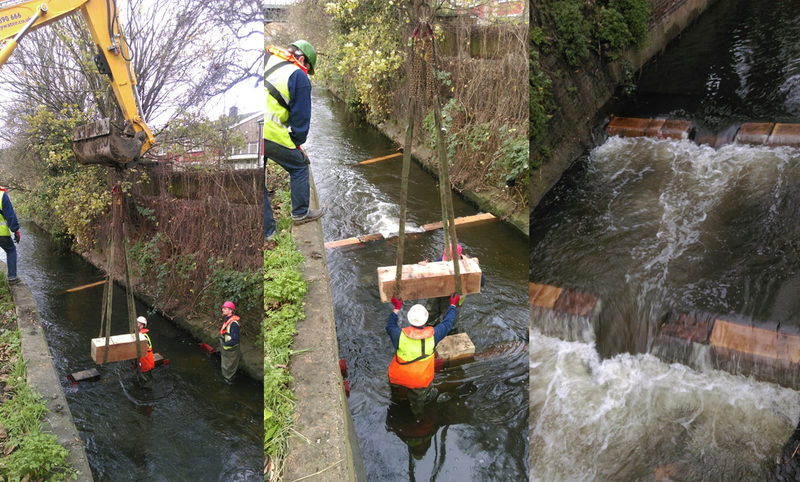 For March this year we headed to North Road in Wimbledon, but we decided to start much further downstream than normal, at the Haydons Road railway bridge. First, however, we all met at the usual spot for the Welcome Talk and Health & Safety Briefing. 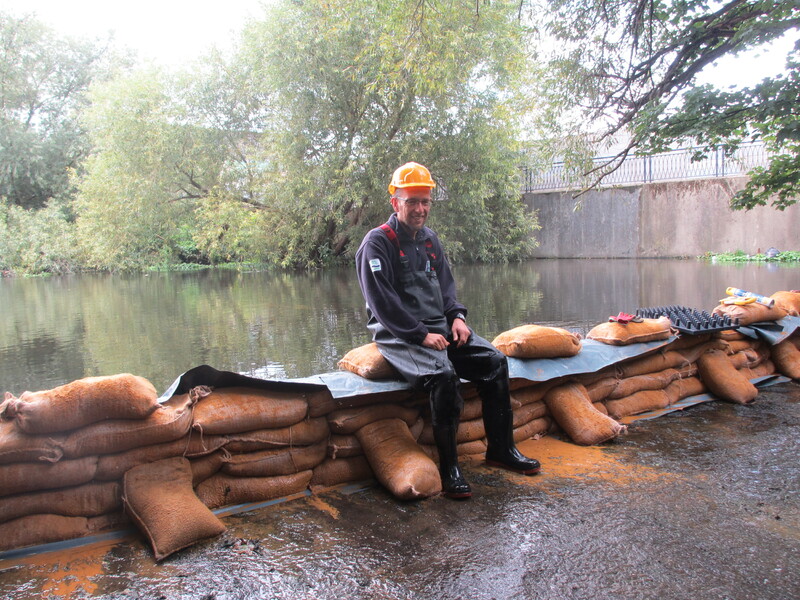 New volunteer, Alex Clements, introduced himself and the work he is doing for a MSc in Environmental Management. 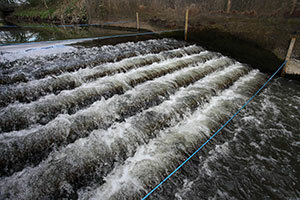 For this he has chosen the Wandle as a case study in how social learning and engagement leads to more effective management of rivers and their water catchments. If you can spare two minutes, please do complete his online survey! After that, we all got stuck in to the main event. Lucky volunteer Joe spotted a friendly chub checking out how the cleanup was going. And an eel which quickly swam away. Quite the spot! 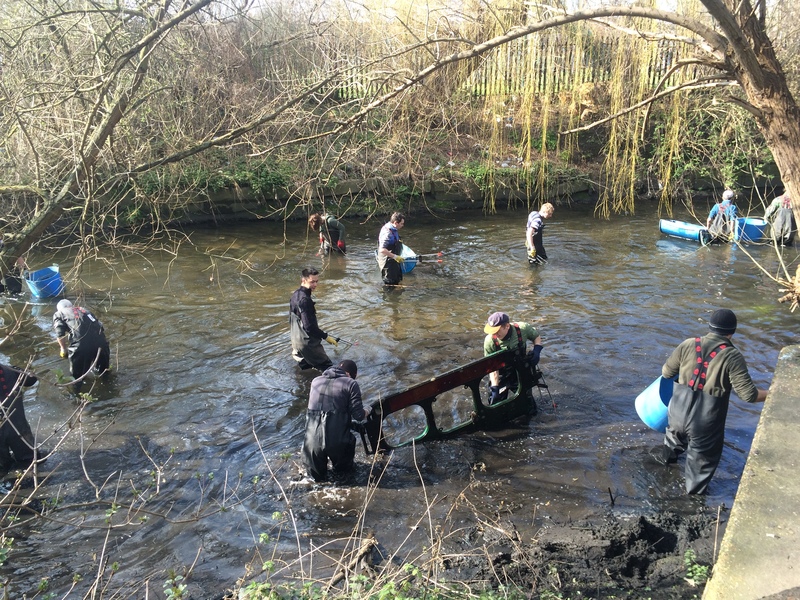 Under the railway bridge, our wading team quickly filled their trugs with all sorts, from tyres to cans to bottles to traffic cones to wallets. The 3 helpers on the banks were soon overwhelmed. 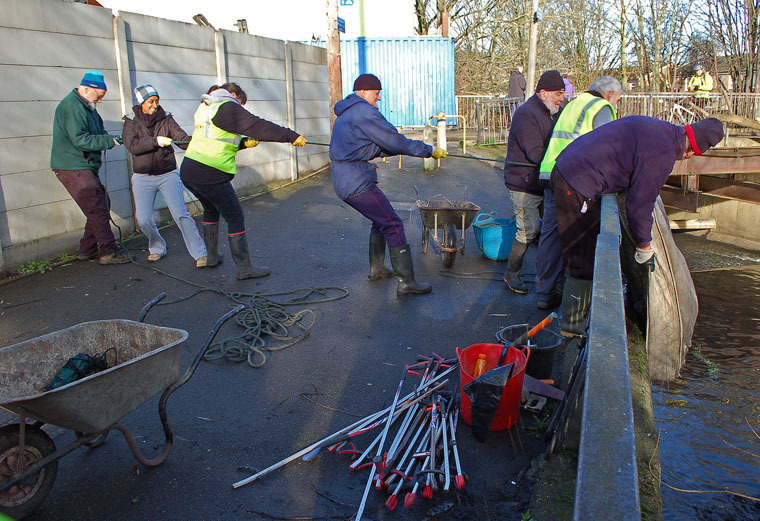 Once the waders reached the footbridge beside Garfield Recreation Ground, we all re-grouped to shift the huge amount of rubbish already found back to the rubbish pile. 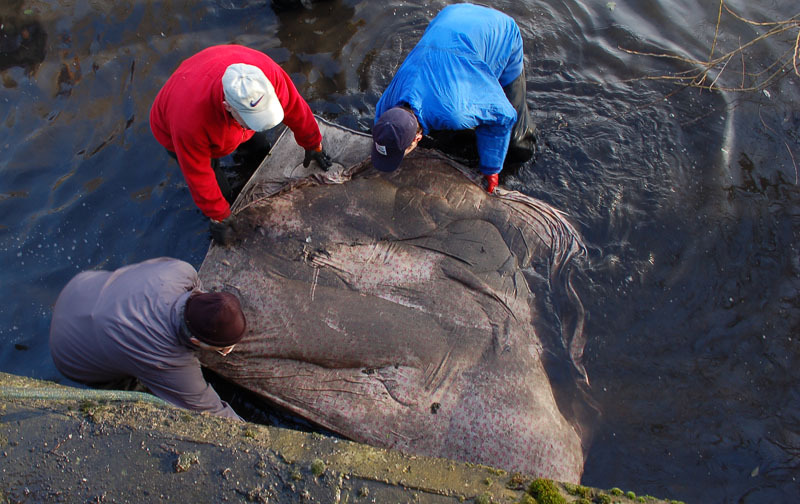 Further up the wading team found a tyre, but it was much, much bigger than our usual catch. 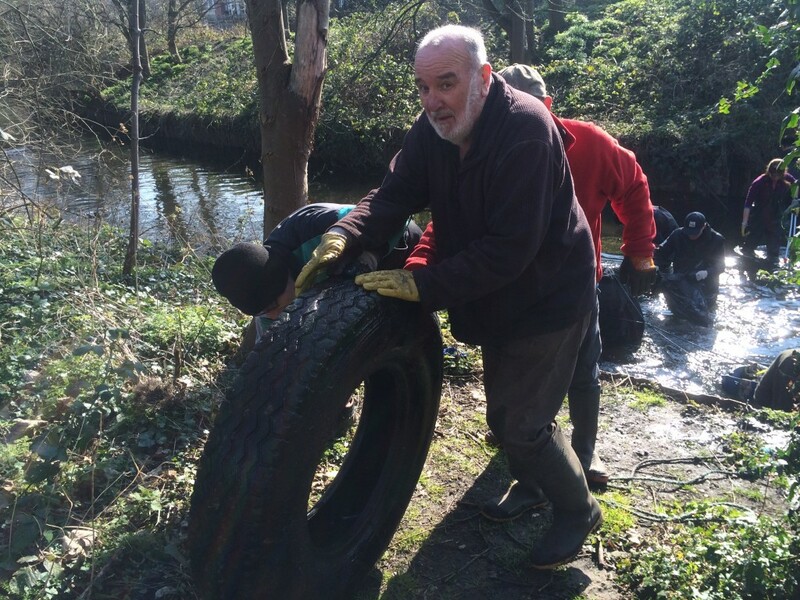 Remembering some of our previous cleanups at Wandle Bank, we think it might have been an old bus tyre? 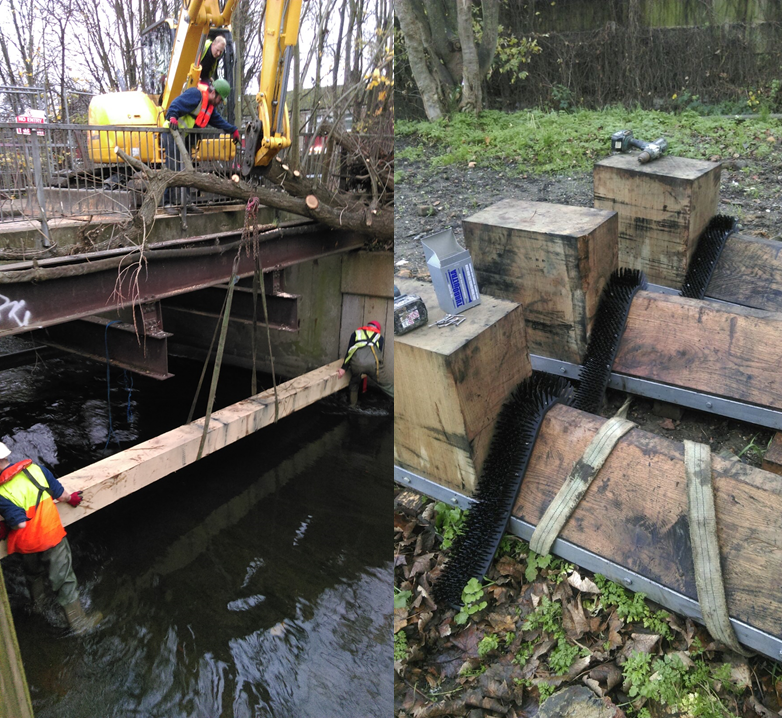 It took all our volunteer muscle to lever it out of the silt, and then more to get it up on the banks and rolled back to base. Soon it was 1pm and time for our scheduled lunch break. We had a lovely cake made by Jackie and the sun came out briefly to warm us up. After lunch we got back to it. As we ventured into more familiar territory towards the North Road Bridge, our finds became smaller. A small team broke off to venture further ahead, finding a couple of trolleys. 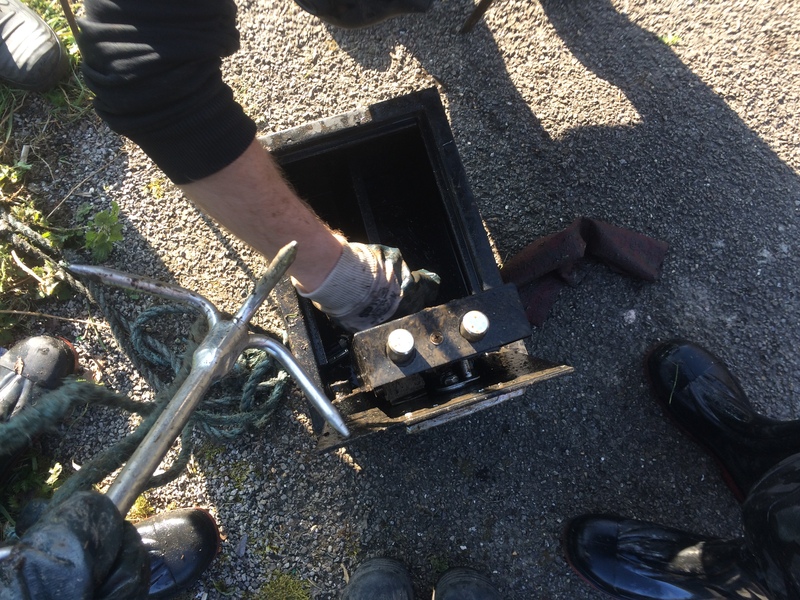 The waders also discovered a safe. Unlike the usual safes we find with the backs blown out, this one was intact and rattling… potential Wandle treasure? Alas, after some clever hacking with a crow bar, we gained 20p… but every little helps? 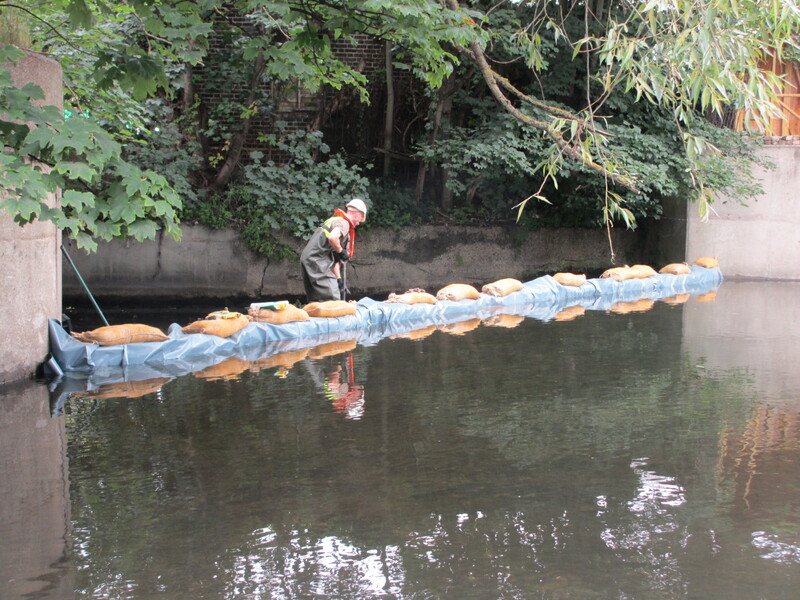 All in all it was a great day, and yet another worryingly large haul from the Wandle! So what did we find? 1 radiator, 1 prisoner card, 1 headless teddy, 1 kitchen chair, 1 bus tyre, 1 bin, 1 traffic fence panel, 1 Christmas tree, 1 chest of drawers (in pieces), 1 barrel, 1 traffic cone, 1 safe and 20p, 2 folding chairs, 2 trolleys, 9 normal size tyres, lots of wooden boarding and bags of bags of other junk. Huge thanks to Thames Water for funding the event, everyone who helped unpack and pack up the van during the event, Jackie for catering for our volunteers, Rosie for supervising the Event Tent and the Waste Management Team at Merton Council for organising collection of all the rubbish the next day. Thank you to all our volunteers for coming: Aaron, Alex, Andy, Bruno, Charles, Claire, Dave, Derek, Ed, Geoffrey, Guy, Ian, Jackie, Joe, John, Keith, Michael, Nick, Nicola, Penny, Per, Phil, Rose, Ruth, Steve, Stewart, Susan, Theo, Victor, Wally and William. 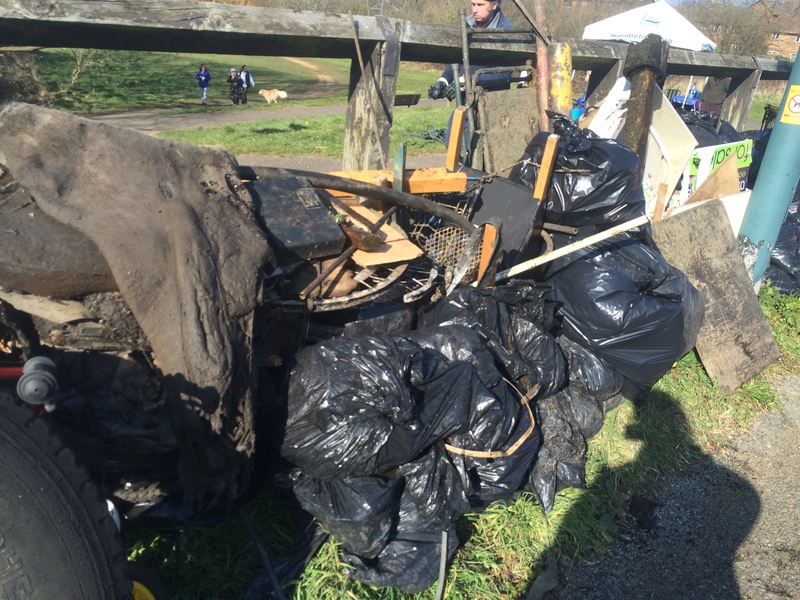 This entry was posted in Uncategorized and tagged Cleanups, Events, People, Spreading the Wandle Word, Thames Water, Volunteer, Wandle on March 24, 2016 by Polly. The one where we worked so hard we finished early..
Firstly, a Happy New Year to everyone! 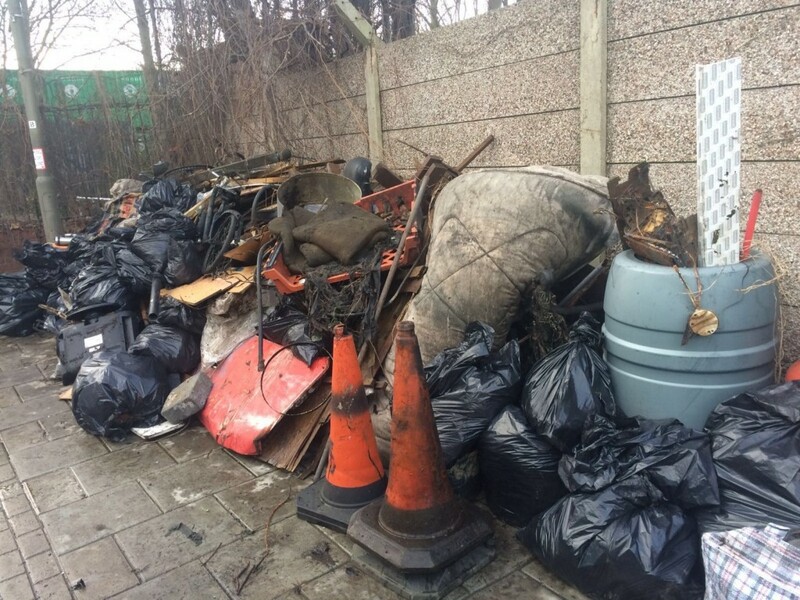 For the first cleanup of 2016, we returned to Trewint Street in Earlsfield following reports of fly-tipping in the river. However little did we know that the day before brought a huge downpour of rain, so when we arrived at 10am on Sunday morning, all the rubbish had been washed further downstream. Oh well, off we go! To start off 2016, I decided to summarise what we had achieved as a group in 2015. 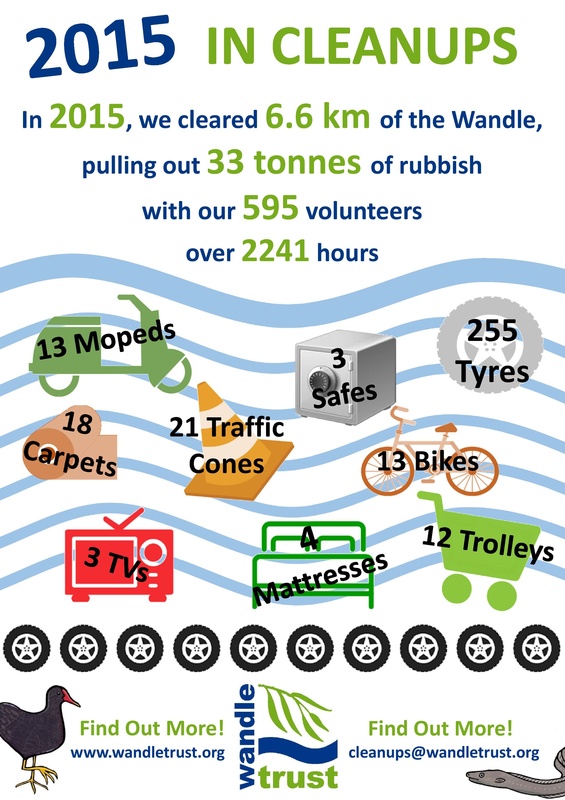 In total, we had spent 2241 hours clearing the Wandle covering 6.6 km of the river with 595 volunteers pulling out 33 tonnes of rubbish. Amazing. Below you can see some of the highlights. After the inspirational talk, it was time to get started. 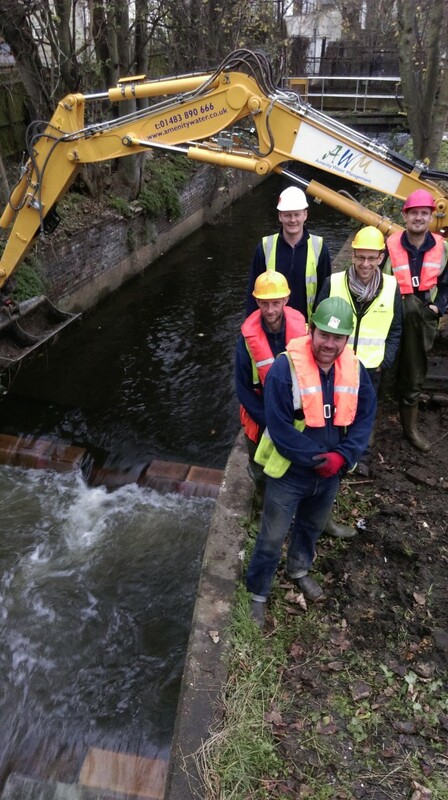 A team of brave waders climbed over the fence into the Wandle and headed downstream under the Trewint Street bridge. A mattress had been spotted a short wade away and everyone’s sights had been set on dragging this back up the river and hauling it out over the concrete bank. A great warm up, we all thought.. Pulling the mattress may look simple enough but it actually took 6 of us hauling on the grapples and holding the mattress in the air while it drained away some of the water it had soaked up. Getting in on a wheelbarrow and to the rubbish pile was a whole new kettle of fish. 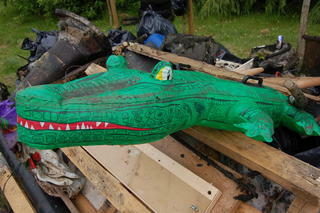 Meanwhile, litter pickers had discovered the large pile of fly-tipping further down the Wandle Trail. 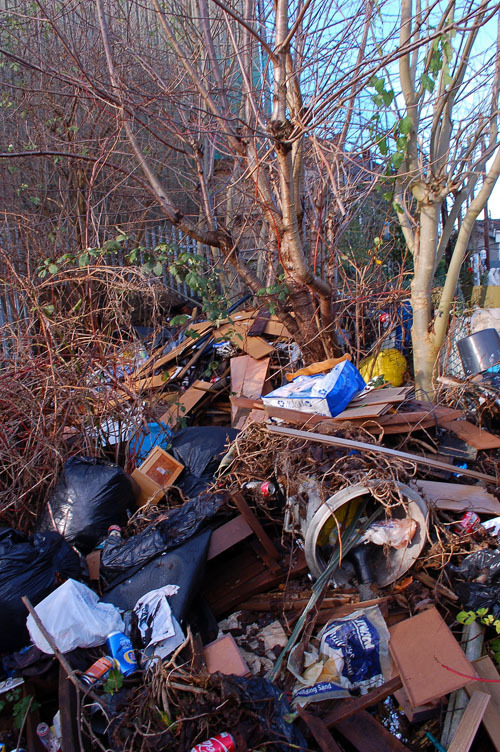 This pile has been kindly re-stocked for every cleanup to date, but a team got stuck in and shifted all sorts to the rubbish pile including water barrels, flooring, fencing, garden furniture and a TV. As the day continued, the rubbish pile got bigger and bigger. 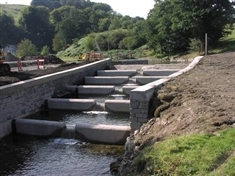 Theo cleared the newly installed fish pass which had caught some branches in the recent high flows on the river. Without getting wet, he managed to remove the branches using the grappling hook, much like one of those grabber arcade games except there was no adorable cuddly toy prize at the end, before clambering down the ladder to dislodge the biggest branches by hand. We stopped slightly early for lunch as we were all pretty cold and in need of a cup of tea. Sally Ann, Jackie and Ann had made some delicious cakes for us all which disappeared in no time. Before we got started again, we had a mini team meeting to work out what to do. 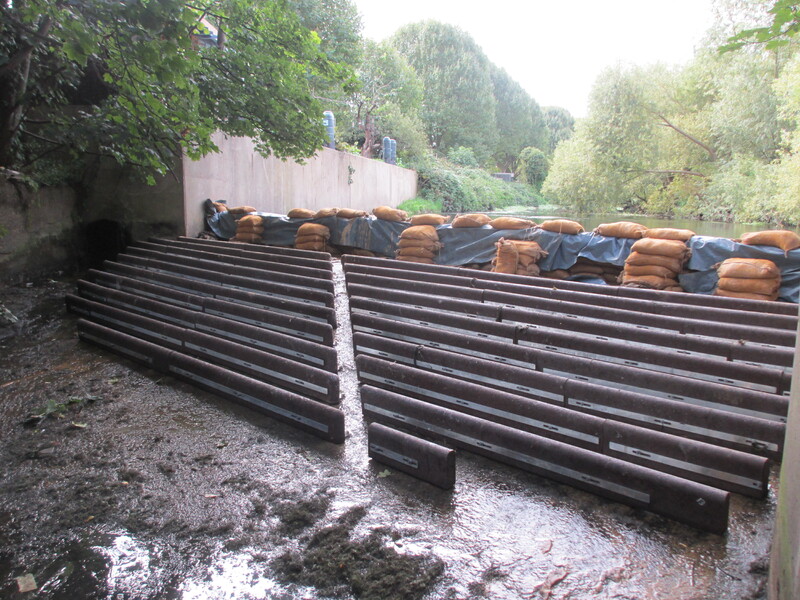 The waders had cleared downstream of the bridge leaving only the upstream route which was known to be full of silt. Bravely, the waders got back in and headed towards Plough Lane. Within 20 m, they were out again! The river was too deep and waders only reach so far up. 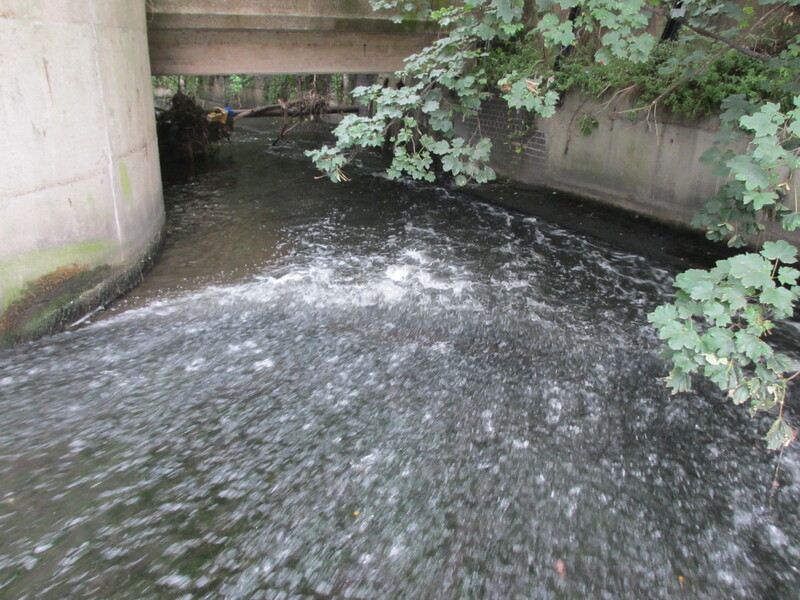 So instead we all walked along the Wandle Trail looking for motorbikes from the banks. For once, we couldn’t see any! Having already removed a huge pile of rubbish we decided to finish slightly early. We packed up the van and all headed home for a much needed warm shower. So what did we find? 1 sodden mattress, 1 desk chair, 1 folding chair, 1 lounger, 1 kitchen chair, 1 picnic table, 1 TV, 1 dustbin, 1 gas canister, 1 push chair, 1 thermos, 1 rusty old air rifle, 1 clothes dryer, 1 heater, 3 traffic cones, 3 water barrels, 4 bicycles, lots and lots of fencing and miscellaneous flooring and bags and bags of other rubbish. Huge thanks to Thames Water for funding the event, everyone who helped unpack and pack up the van during the event, Ann, Jackie and Sally Ann for catering for our volunteers, Wally & Theo for supervising with me and Rosie for supervising the Event Tent, and the Waste Management Team at Wandsworth Council for organising collection of all the rubbish the next day. 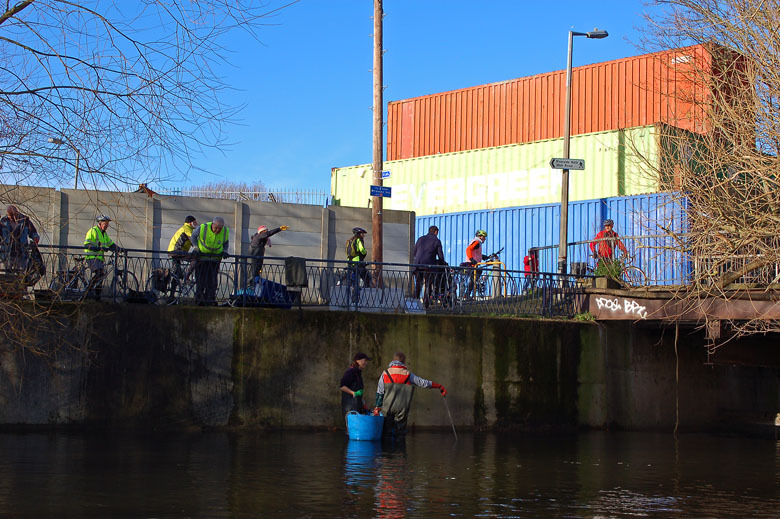 This entry was posted in Uncategorized and tagged 2015, 2016, Cleanups, Events, People, Thames Water, Trewint Street, Volunteer, Wandle, Wandsworth on January 26, 2016 by Polly.